Following the trail of several corpses seemingly killed by wild animals, Holmes and Watson stumble upon the experiments of Doctor Moreau. Moreau, through vivisection and crude genetic engineering is creating animal hybrids, determined to prove the evolutionary theories of Charles Darwin. In his laboratory, hidden among the opium dens of Rotherhithe, Moreau is building an army of 'beast men'. Tired of having his work ignored -- or reviled -- by the British scientific community, Moreau is willing to make the world pay attention using his creatures as a force to gain control of the government. A brand-new adventure for Conan Doyle's intrepid sleuth! Oh Sherlock Holmes, why was I not obsessed with you as a teenager? You’re so clever and hate just about everyone. You’re essentially a teenager living in a grown man’s body, except smarter and possibly with poorer societal manners. I have a confession to make – I’ve never actually read any of the Arthur Conan Doyle Sherlock Holmes stories. It’s always been on the list somewhere between “Read Stephen King” and “Reread Wurthering Heights now that you’re an adult and probably will ‘get it’ more”, but none of those things have happened. Instead my exposure to Sherlock Holmes is primarily the way everyone my age has experienced Sherlock – through the re-contextualization brought to us by the geniuses of Downey and Cumberbatch. The Sherlock of Guy Adams’ making is far more Cumberbatch than Downey, which is my preferred type of Sherlock – consciously awkward and not giving a damn about it. In my head this was a lost episode of Sherlock except with far more fantasy elements and perhaps not enough of Sherlock talking down to people. But that’s okay because it’s a fun ride nonetheless. As with all good Sherlock Holmes stories, this one is told primarily through the guise of sidekick Watson, who – as with all good Sherlock Holmes stories – finds his companion insufferable, brilliant and generally wants to hit him in the face. As this is the second in a new series, there are passing references to a previous case, but not enough to have made me feel like I was missing something. Instead there is chasing monsters in sewers, tracking down deranged scientists, putting on disguises to infiltrate the underworld and making fun of Mycroft for being fat, lazy and secretive. Everything you need for a satisfying mystery. Adams ties in The Island of Doctor Moreau as a background to set his Sherlock Holmes story after. A passing familiarity with the HG Well’s story is helpful, but not necessary. There’s plenty of talk about Moreau’s fascinating with vivisection and pieces together animal and human parts to create giant monsters to do his bidding (though if you’ve seen or read anything regarding mad scientists, that never ends well). Everything is neatly blended together until two things originally from the middles of others becomes something new and fun. 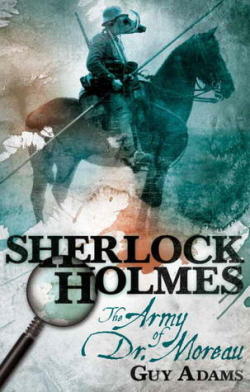 Towards the end of the book, by sheer necessity of the story, Adams goes from telling everything from the point of view of Watson to swapping around the consciousness of the other members of Sherlock’s search party. I was impressed by how distinctive Adams made these short chapters told from the viewpoint of characters otherwise seen from an outside perspective. Each character had a clear voice that fit what had been experienced earlier through the lens of Watson’s experience, while telling different pieces of the story occurring simultaneously. The only real complaint is that it felt like everything ended very suddenly. This might have been something pulled from the original format of the Sherlock stories – as I mentioned, never read them – but once the case was solved, the story was over. No closing thoughts, no hashing out the details after the dust had settled, no returning to Mycroft to taunt him with their ability to clean up what he could not. It’s not that this was a bad thing, just unexpected and left me a bit jarred. It’s not often that you find a book that ends the moment everything is resolved. Adams has found a way to modernize Sherlock without actually modernizing him. This is still the Victorian era without the gizmos and gadgets that might make things a little easier to maneuver through if it were happening today, but The Army of Doctor Moreau doesn’t feel dated or stuffy as though it’s a story that might have been told a million times with a little bit of dust living on its pages. I have a soft spot for twisting classic stories and Adams does a fantastic job weaving together two very interesting and classic tales into something that was just fun to experience. I received a copy of this book from the publisher in return for an honest review. I sincerely apologize for it taking so long.